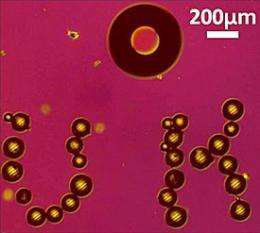 (PhysOrg.com) -- Robotic automation, microrobotics and robotic perception and recognition all advanced a few steps closer to their future applications in manufacturing, health care and other areas during the week of May 9-13, 2011. Thats when the National Institute of Standards and Technology (NIST) hosted three of the four robotics competitions at the IEEE International Conference on Robotics and Automation (ICRA) in Shanghai, China. The trio of contests are designed to prove the viability of advanced robotics and microrobotics technologies. In the first of two Virtual Manufacturing Automation Competition (VMAC) matches, contestants used open-source evaluation tools to judge a computer plan of a robot picking up boxes of various sizes and weights from a conveyor belt and arranging them on a pallet for shipping. The second half of the VMAC used off-the-shelf computer gaming engines to create simulations that virtually road tested a robot teams ability to load trucks with pallets delivered from a warehouse. Drexel University (Philadelphia, Pa.) won the mixed palletizing contest and Hood College (Frederick, Md.) won the truck loading contest. Other teams competing in the VMAC were from Georgia Tech (Atlanta, Ga.) and the University of Zagreb (Zagreb, Croatia). Georgia Tech was the co-organizer of the VMAC. In the Mobile Microrobotics Challenge (MMC), seven teams from Canada, Europe and the United States pitted their miniature athleteswhose dimensions are measured in micrometers (millionths of a meter)against each other in two events. The mobility challenge required the microbots to navigate a two-dimensional maze about the size of a sesame seed. In the microassembly challenge, the competitors had to put together multiple microscale components in a narrow channel to simulate two applications: operation within a blood vessel by future medical microbots and assembly-based micromanufacturing. The French Teama group consisting of researchers from the FEMTO-ST Institute (Bensaçon, France); the Institut des Systèmes Intelligents et de Robotique, or ISIR (Paris, France); and the Laboratoire de Photonique et Nanostructures, or LPN (Marcoussis, France)sped through the maze in a scorching 2.23 seconds, more than a half-a-minute faster than runner-up University of Hawaiis bubble microrobot (so named because the robot is actually a gas bubble in solution). The University of Waterloo (Waterloo, Ontario, Canada) was the winner in the microassembly event, densely packing together a formation of triangular-shaped lattice components that was 45 micrometers in length. The Waterloo robot was the only one able to complete the task. Other teams competing in the MMC were the University of Maryland-College Park; the Stevens Institute of Technology (Hoboken, N.J.); the University of Texas at Arlington; and the Italian Team, composed of members from the Italian Institute of Technology (Pontedera, Italy) and the CRIM Lab of Scuola Superiore SantAnna (Pisa, Italy). The third competition, the first-ever Solutions in Perception Challenge (SPC), was co-hosted by Willow Garage, a developer of hardware and open-source software for personal robotics applications. Teams in this contest were evaluated on how well their sensing software identified and determined the positions of 35 common household items and 15 manufacturing components. Robust perception is a core skill for next-generation robots to operate successfully in both cluttered and uncluttered environments, such as factory floors, nursing homes and even disaster sites. First place with a score of 68.78 percent went to the team from the University of California, Berkeley, with second and third taken by Jacob University (Bremen, Germany) at 66.41 percent and Stanford University (Palo Alto, Calif.) at 53.61 percent, respectively. Four other teams made up the contestant pool for the SPC: University of Freiburg (Freiburg, Germany); Rekno Robotics (La Spezia, Italy); the University of Arkansas at Little Rock; and the State University of New York at Buffalo. Is Your Microrobot Up for the (NIST) Challenge?